I just received these photos from Megana, a great regular customer who has bought several of my hats for herself and her daughter George. George is pictured below wearing a Kit Kit mini bowler in long-nap fur felt with a cockade and feather spikes. 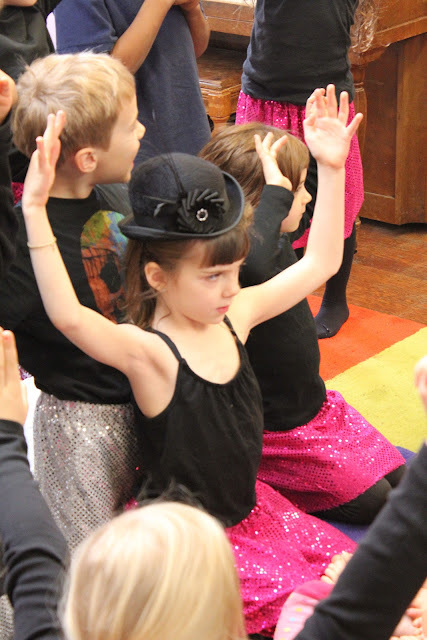 She has enjoyed wearing it around the house and during a recent vaudeville-themed dance performance at school. 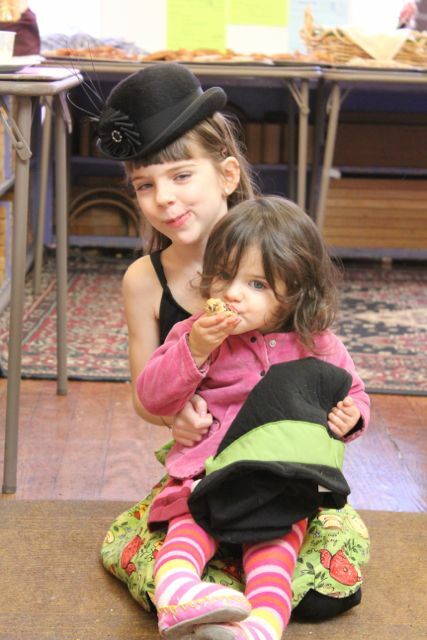 I'm always so excited to outfit performers, especially such adorable ones. 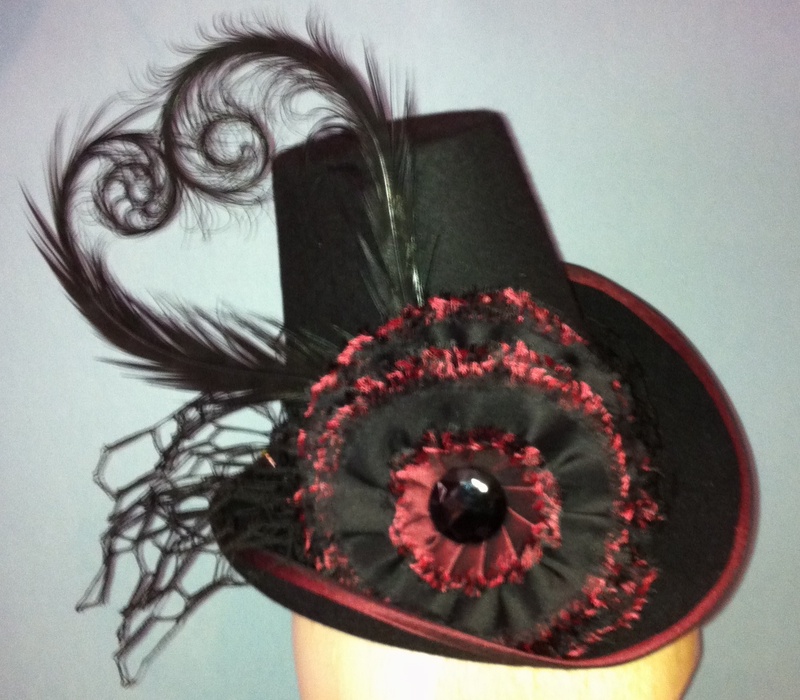 And I recently completed the following custom hat for George's mom, Megana. Please excuse the fast-and-dirty quality of the photo- I needed to get this one out the door for a fast delivery so I didn't have time to take a proper studio photo. 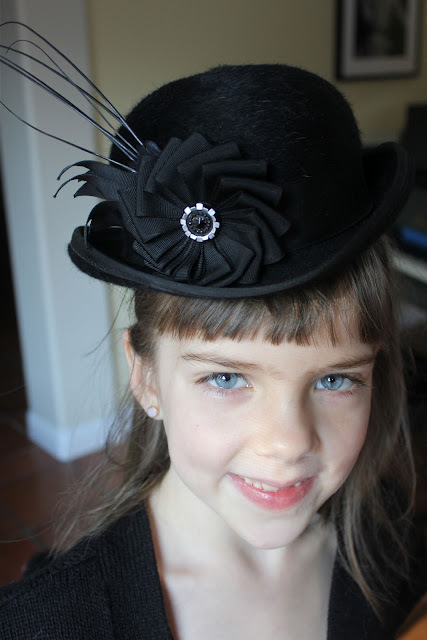 We designed this Vermeer cocktail hat to match an outfit Megana had custom made at Dark Garden, the trim was made using the same iridescent black/wine taffeta fabric as that she chose for her corset. The rosette is made of layers and layers of pleated taffeta, alternating with black silk gazar, and frayed at the edges because Megana let me know that she likes texture. 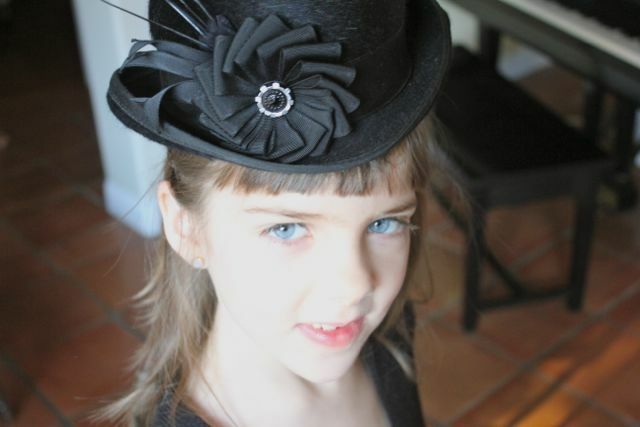 It also has black vintage crocheted veiling and a matching silk taffeta lining. I included several sets of feathers to wear with it, all matching the hat but totally different from each other so she can try out different looks- curled pheasant (seen here), fluffy wine-colored ostrich floss plumes, and others. I can't wait to see photos of how Megana looks in the whole outfit.